Isaac Lowe is looking forward to getting back in the ring this weekend knowing his big British title rematch has been confirmed. Morecambe’s former Commonwealth featherweight champion is in action at Windsor Park in Belfast on Saturday night in a card headlined by home favourite Carl Frampton and Lowe’s good friend and training partner Tyson Fury. The 24-year-old will be working with new trainer Ben Davison for the first time as he keeps busy ahead of facing Lonsdale belt holder Ryan Walsh for a second time. The pair drew after 12 thrilling rounds at the Manchester Arena in February with promoter Eddie Hearn confirming they will meet again at the Copper Box Arena in London’s Olympic Park on October 27. 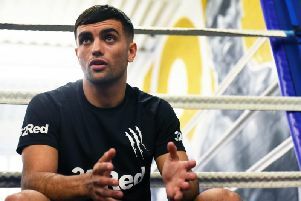 First things first though, Lowe knows he has to stick to his task against an opponent to be confirmed on Frank Warren’s major stadium show in Northern Ireland. “I haven’t fought in Belfast before,” said Lowe. “I’m fighting in a stadium for the first time as well. “I’m looking forward to getting over there in front of the Irish fans because they are really passionate about their boxing. “It’s a great card too. Carl Frampton, Tyson and more. It’s going to be packed Windsor Park with 25,000 and another good experience, something that’s going to stand me in good stead for the British title fight. The tick-over fight presents a good chance for Lowe and Davison to work together before the Westgate Warrior’s big night later in the year. “It’s good to get the fight in to see how we work,” said Lowe, now based at Ricky Hatton’s gym in Hyde. “He can see things differently and pick up things from how I fight. Sparring and training are a lot different to fight night. “It will be great to get in there and see how it works and how it unfolds. We’ll take things from there but at the moment Ben and I have got a great relationship. “We’re laughing, joking, but when we’re at work in the gym it’s all serious. “We’re doing well and I’m looking forward to getting in there. "There will be no excuses come fight night, I’ll be in the shape of my life."